Mendelevium is a synthetic element with chemical symbol Md (formerly Mv) and atomic number 101. A metallic radioactive transuranic element in the actinide series, it is the first element that currently cannot be produced in macroscopic quantities through neutron bombardment of lighter elements. It is the third-to-last actinide and the ninth transuranic element. It can only be produced in particle accelerators by bombarding lighter elements with charged particles. A total of sixteen mendelevium isotopes are known, the most stable being 258Md with a half-life of 51 days; nevertheless, the shorter-lived 256Md (half-life 1.17 hours) is most commonly used in chemistry because it can be produced on a larger scale. Mendelevium was discovered by bombarding einsteinium with alpha particles in 1955, the same method still used to produce it today. 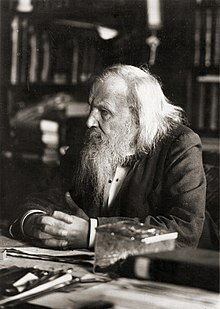 It was named after Dmitri Mendeleev, father of the periodic table of the chemical elements. Using available microgram quantities of the isotope einsteinium-253, over a million mendelevium atoms may be produced each hour. The chemistry of mendelevium is typical for the late actinides, with a preponderance of the +3 oxidation state but also an accessible +2 oxidation state. Owing to the small amounts of produced mendelevium and all of its isotopes having relatively short half-lives, there are currently no uses for it outside basic scientific research. Mendelevium was the ninth transuranic element to be synthesized. It was first synthesized by Albert Ghiorso, Glenn T. Seaborg, Gregory Robert Choppin, Bernard G. Harvey, and team leader Stanley G. Thompson in early 1955 at the University of California, Berkeley. The team produced 256Md (half-life of 77 minutes) when they bombarded an 253Es target consisting of only a billion (109) einsteinium atoms with alpha particles (helium nuclei) in the Berkeley Radiation Laboratory's 60-inch cyclotron, thus increasing the target's atomic number by two. 256Md thus became the first isotope of any element to be synthesized one atom at a time. In total, seventeen mendelevium atoms were produced. This discovery was part of a program, begun in 1952, that irradiated plutonium with neutrons to transmute it into heavier actinides. This method was necessary as the previous method used to synthesize transuranic elements, neutron capture, could not work because of a lack of known beta decaying isotopes of fermium that would produce isotopes of the next element, mendelevium, and also due to the very short half-life to spontaneous fission of 258Fm that thus constituted a hard limit to the success of the neutron capture process. Being the first of the second hundred of the chemical elements, it was decided that the element would be named "mendelevium" after the Russian chemist Dmitri Mendeleev, father of the periodic table. Because this discovery came during the Cold War, Seaborg had to request permission of the government of the United States to propose that the element be named for a Russian, but it was granted. The name "mendelevium" was accepted by the International Union of Pure and Applied Chemistry (IUPAC) in 1955 with symbol "Mv", which was changed to "Md" in the next IUPAC General Assembly (Paris, 1957). The lanthanides and actinides, in the metallic state, can exist as either divalent (such as europium and ytterbium) or trivalent (most other lanthanides) metals. The former have fnd1s2 configurations, whereas the latter have fn+1s2 configurations. In 1975, Johansson and Rosengren examined the measured and predicted values for the cohesive energies (enthalpies of crystallization) of the metallic lanthanides and actinides, both as divalent and trivalent metals. The conclusion was that the increased binding energy of the [Rn]5f126d17s2 configuration over the [Rn]5f137s2 configuration for mendelevium was not enough to compensate for the energy needed to promote one 5f electron to 6d, as is true also for the very late actinides: thus einsteinium, fermium, mendelevium, and nobelium were expected to be divalent metals. The increasing predominance of the divalent state well before the actinide series concludes is attributed to the relativistic stabilization of the 5f electrons, which increases with increasing atomic number. Thermochromatographic studies with trace quantities of mendelevium by Zvara and Hübener from 1976 to 1982 confirmed this prediction. In 1990, Haire and Gibson estimated mendelevium metal to have an enthalpy of sublimation between 134 and 142 kJ/mol. Divalent mendelevium metal should have a metallic radius of around 7002194000000000000♠194±10 pm. Like the other divalent late actinides (except the once again trivalent lawrencium), metallic mendelevium should assume a face-centered cubic crystal structure. Mendelevium's melting point has been estimated at 827 °C, the same value as that predicted for the neighboring element nobelium. Its density is predicted to be around 7001103000000000000♠10.3±0.7 g/cm3. In reducing conditions, mendelevium(III) can be easily reduced to mendelevium(II), which is stable in aqueous solution. The standard reduction potential of the E°(Md3+→Md2+) couple was variously estimated in 1967 as −0.10 V or −0.20 V: later 2013 experiments established the value as 3000840000000000000♠−0.16±0.05 V. In comparison, E°(Md3+→Md0) should be around −1.74 V, and E°(Md2+→Md0) should be around −2.5 V. Mendelevium(II)'s elution behavior has been compared with that of strontium(II) and europium(II). Although E°(Md4+→Md3+) was predicted in 1975 to be +5.4 V, suggesting that mendelevium(III) could be oxidized to mendelevium(IV), 1967 experiments with the strong oxidizing agent sodium bismuthate were unable to oxidize mendelevium(III) to mendelevium(IV). A mendelevium atom has 101 electrons, of which at least three (and perhaps four) can act as valence electrons. They are expected to be arranged in the configuration [Rn]5f137s2 (ground state term symbol 2F7/2), although experimental verification of this electron configuration had not yet been made as of 2006. In forming compounds, three valence electrons may be lost, leaving behind a [Rn]5f12 core: this conforms to the trend set by the other actinides with their [Rn] 5fn electron configurations in the tripositive state. The first ionization potential of mendelevium was measured to be at most (6.58 ± 0.07) eV in 1974, based on the assumption that the 7s electrons would ionize before the 5f ones; this value has since not yet been refined further due to mendelevium's scarcity and high radioactivity. The ionic radius of hexacoordinate Md3+ had been preliminarily estimated in 1978 to be around 91.2 pm; 1988 calculations based on the logarithmic trend between distribution coefficients and ionic radius produced a value of 89.6 pm, as well as an enthalpy of hydration of 2993634600000000000♠−3654±12 kJ/mol. Md2+ should have an ionic radius of 115 pm and hydration enthalpy −1413 kJ/mol; Md+ should have ionic radius 117 pm. Sixteen isotopes of mendelevium are known, with mass numbers from 245 to 260; all are radioactive. Additionally, five nuclear isomers are known: 245mMd, 247mMd, 249mMd, 254mMd, and 258mMd. Of these, the longest-lived isotope is 258Md with a half-life of 51.5 days, and the longest-lived isomer is 258mMd with a half-life of 58.0 minutes. Nevertheless, the slightly shorter-lived 256Md (half-life 1.17 hours) is more often used in chemical experimentation because it can be produced in larger quantities from alpha particle irradiation of einsteinium. After 258Md, the next most stable mendelevium isotopes are 260Md with a half-life of 31.8 days, 257Md with a half-life of 5.52 hours, 259Md with a half-life of 1.60 hours, and 256Md with a half-life of 1.17 hours. All of the remaining mendelevium isotopes have half-lives that are less than an hour, and the majority of these have half-lives that are less than 5 minutes. Although few people come in contact with mendelevium, the International Commission on Radiological Protection has set annual exposure limits for the most stable isotope. For mendelevium-258, the ingestion limit was set at 9×105 becquerels (1 Bq is equivalent to one decay per second), and the inhalation limit at 6000 Bq. ^ a b c d Fournier, Jean-Marc (1976). "Bonding and the electronic structure of the actinide metals". Journal of Physics and Chemistry of Solids. 37 (2): 235–244. Bibcode:1976JPCS...37..235F. doi:10.1016/0022-3697(76)90167-0. ^ a b c d Ghiorso, A.; Harvey, B.; Choppin, G.; Thompson, S.; Seaborg, Glenn T. (1955). New Element Mendelevium, Atomic Number 101. Physical Review. 98. pp. 1518–1519. Bibcode:1955PhRv...98.1518G. doi:10.1103/PhysRev.98.1518. ISBN 9789810214401. ^ a b c d e f g h Choppin, Gregory R. (2003). "Mendelevium". Chemical and Engineering News. 81 (36). ^ Hofmann, Sigurd (2002). On beyond uranium: journey to the end of the periodic table. CRC Press. pp. 40–42. ISBN 978-0-415-28496-7. ^ a b c Hall, Nina (2000). The new chemistry. Cambridge University Press. pp. 9–11. ISBN 978-0-521-45224-3. ^ 101. Mendelevium - Elementymology & Elements Multidict. Peter van der Krogt. ^ Chemistry, International Union of Pure and Applied (1955). Comptes rendus de la confèrence IUPAC. ^ Chemistry, International Union of Pure and Applied (1957). Comptes rendus de la confèrence IUPAC. ^ Haire, Richard G. (2006). "Einsteinium". In Morss, Lester R.; Edelstein, Norman M.; Fuger, Jean (eds.). The Chemistry of the Actinide and Transactinide Elements (PDF). 3 (3rd ed.). Dordrecht, the Netherlands: Springer. pp. 1577–1620. doi:10.1007/1-4020-3598-5_12. ISBN 978-1-4020-3555-5. ^ Johansson, Börje; Rosengren, Anders (1975). "Generalized phase diagram for the rare-earth elements: Calculations and correlations of bulk properties". Physical Review B. 11 (8): 2836–2857. Bibcode:1975PhRvB..11.2836J. doi:10.1103/PhysRevB.11.2836. ^ Hulet, E. K. (1980). "Chapter 12. Chemistry of the Heaviest Actinides: Fermium, Mendelevium, Nobelium, and Lawrencium". In Edelstein, Norman M. (ed.). Lanthanide and Actinide Chemistry and Spectroscopy. ACS Symposium Series. 131. pp. 239–263. doi:10.1021/bk-1980-0131.ch012. ISBN 9780841205680. ^ Haynes, William M., ed. (2011). CRC Handbook of Chemistry and Physics (92nd ed.). CRC Press. pp. 4.121–4.123. ISBN 978-1439855119. ^ Toyoshima, Atsushi; Li, Zijie; Asai, Masato; Sato, Nozomi; Sato, Tetsuya K.; Kikuchi, Takahiro; Kaneya, Yusuke; Kitatsuji, Yoshihiro; Tsukada, Kazuaki; Nagame, Yuichiro; Schädel, Matthias; Ooe, Kazuhiro; Kasamatsu, Yoshitaka; Shinohara, Atsushi; Haba, Hiromitsu; Even, Julia (11 October 2013). "Measurement of the Md3+/Md2+ Reduction Potential Studied with Flow Electrolytic Chromatography". Inorganic Chemistry. 52 (21): 12311–3. doi:10.1021/ic401571h. PMID 24116851. ^ Martin, W. C.; Hagan, Lucy; Reader, Joseph; Sugan, Jack (1974). "Ground Levels and Ionization Potentials for Lanthanide and Actinide Atoms and Ions" (PDF). J. Phys. Chem. Ref. Data. 3 (3): 771–9. Bibcode:1974JPCRD...3..771M. doi:10.1063/1.3253147. Archived from the original (PDF) on 2014-02-11. Retrieved 2013-10-19. ^ a b c d e Nucleonica (2007–2014). "Universal Nuclide Chart". Nucleonica. Retrieved 22 May 2011. ^ Nurmia, Matti (2003). "Nobelium". Chemical and Engineering News. 81 (36). Silva, Robert J. (2006). "Fermium, Mendelevium, Nobelium, and Lawrencium" (PDF). In Morss, Lester R.; Edelstein, Norman M.; Fuger, Jean (eds.). The Chemistry of the Actinide and Transactinide Elements. 3 (3rd ed.). Dordrecht: Springer. pp. 1621–1651. doi:10.1007/1-4020-3598-5_13. ISBN 978-1-4020-3555-5. Archived from the original (PDF) on 2010-07-17.